Taiwan on Tuesday put into service its fleet of US-made Apache attack helicopters, upgrading its defences against a growing military threat from China. The US sold 30 Apache AH-64E -- also known as the "tank killer" -- to Taiwan as part of a $6.5 billion arms deal announced in 2008 that angered Beijing. China sees the self-ruled island as part of its own territory to be reunified, by force if necessary, and opposes any weapons sales to Taiwan. Washington is the biggest deterrent against any Chinese invasion. Although it does not have official diplomatic relations with Taiwan, it is required to supply defensive weapons under the 1979 Taiwan Relations Act. The Taiwanese military was the first force outside the US to use the latest variant of Boeing's Apache AH-64, which was delivered to the island between November 2013 and October 2014. Boeing describes it as "the world's most advanced multi-role combat helicopter" and it has been sold to countries including Japan and the UK. 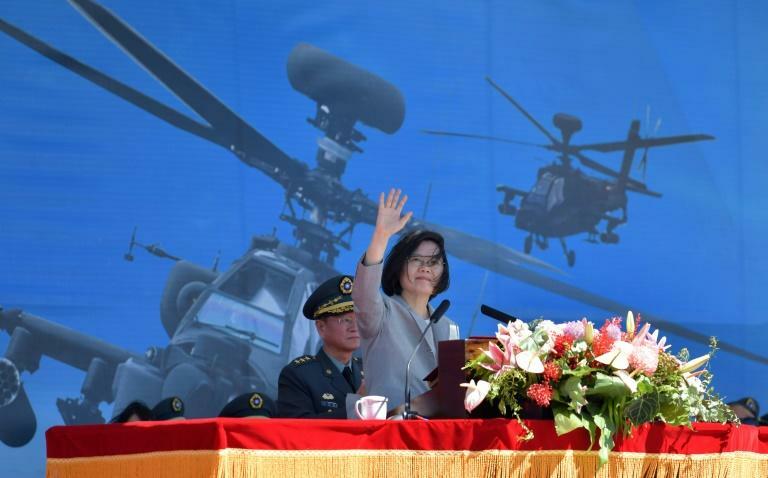 President Tsai Ing-wen hailed the commissioning of the fleet as "a very strong line of defence" at a ceremony Tuesday at a military base in the northwestern city of Taoyuan. "The excellent combat skills we see today are the result of such difficult training," Tsai said, adding 84 weeks of flight training are required to qualify as an Apache pilot. The Apaches were joined by other aircraft in performing flybys and in-air manoeuvres. But only 29 were commissioned as one was damaged when it crash-landed on a building during training in April 2014. Taiwan's military also introduced Asia's first female Apache AH-64E pilot. Yang Yun-hsuan, an army major, said she was following in the footsteps of her father, who was also a pilot. China has stepped up diplomatic and military pressure on Taiwan since the Beijing-sceptic Tsai took office two years ago, including staging a series of military exercises near the island. Beijing is also incensed by recent warming moves between Washington and Taipei. These include approval by the US State Department of a preliminary licence needed to sell submarine technology to the island.